Las Vegas is already known for its mega-casinos, each of which has its own usually-outlandish theme. From Paris to New York, Venice, to the world’s largest black pyramid, these multi-billion dollar hotels and casinos make Las Vegas the stunning spectacle that it is today. But no matter how crazy you think Vegas is today, just wait until you see what’s coming! Las Vegas is in the middle of a boom, with even more outlandish mega-casinos being built, and tens of billions of dollars being pumped into construction. 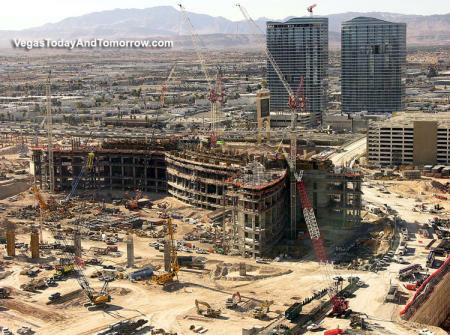 Here’s a list of the top 5 Las Vegas mega-casinos that are currently under construction. The new Las Vegas Montreux will be a $1.9 billion, 2,750 room hotel and casino complex based on a Swiss theme. To me, a Swiss theme means mountains, but there aren’t any planned for the Montreux, and looking at it, I’m not entirely sure where the Swiss influences are! What the Montreux will offer, though, is a giant 465-foot observation wheel similar to the London Eye, giving outstanding views across the Las Vegas strip. 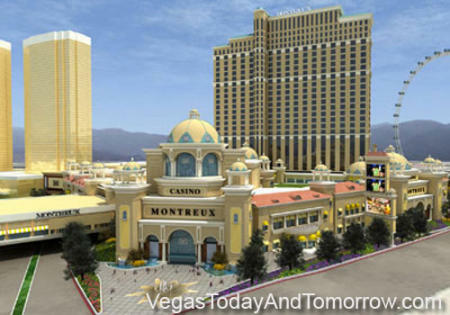 In addition, the Montreux will feature a 104,000 square foot casino, and a giant shopping mall that links directly to the existing Fashion Show giant shopping mall. The Fashion Show is already huge. The thought of having two interlinked giant malls next to each other makes the mind boggle. Just how much shopping does one person need to do?! Located on the site of the old Frontier (which was demolished a while ago), The Montreux will be an upmarket hotel, featuring bars, restaurants and nightclubs. Given its location immediately opposite the new Wynn Encore and in front of the new Echelon Place (both new mega-casinos currently under construction), it’ll have to be upmarket, though, as a downmarket place in an upmarket neighbourhood is not going to draw the crowds. 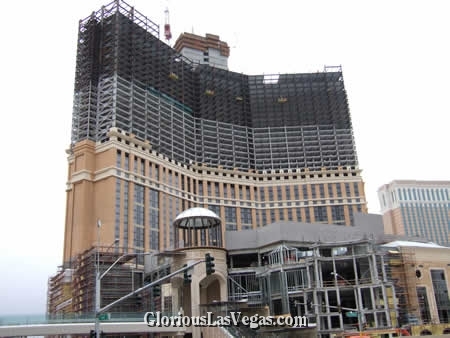 The Las Vegas Montreux is expected to open in early 2009. Further up the north end of the Las Vegas strip, the new Cosmopolitan Hotel and resort is under construction. 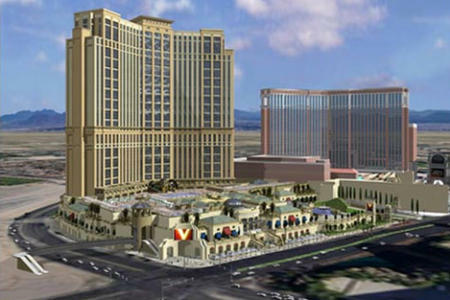 Situated next to the famous Bellagio Hotel, the Cosmopolitan will be a $2 billion hotel and casino featuring 3,000 condo units, 800 hotel rooms, a 75,00 square foot casino and over 300,00 square feet of retail space. It will even boast 40,000 square feet for a spa! 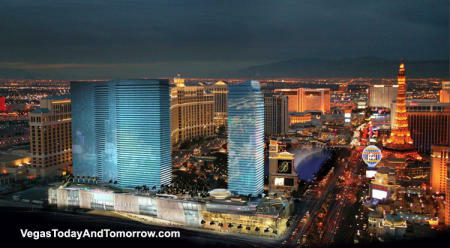 The Cosmopolitan will be the last word in luxury, and will boast stunning views of the famous Bellagio fountains. Opening late 2009, the Cosmopolitan has no theme, unlike the Montreux, just sheer exclusivity. The Palazzo is a new extension of the famous Venetian Hotel, which, as its name suggests, is a replica of many of the famous sites of Venice (complete with Gondliers that meander in and out of the main hotel). I say extension – it’s actually a completely independent building, but as it joins The Venetian at various points, the two buildings together will form the world’s largest hotel, offering 7,074 hotel rooms and suites. 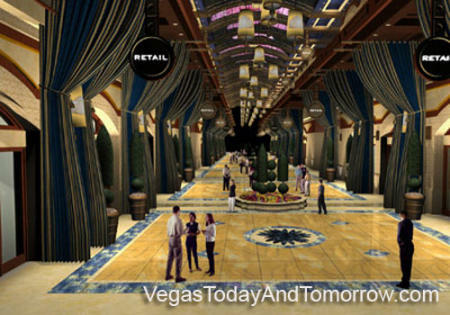 The Palazzo also focuses on luxury (a common theme in the latest Vegas hotels), and will feature a 60 foot glass domed entry lobby, flanked by fountains that reach two-stories high. 375,000 square feet for shops. Yes, you read that right – on top of the huge amount of retail space offered by the Fashion Show mall and the forthcoming Montreux, plus the existing shops in The Venetian, The Palazzo is adding even more shops to the strip – and that’s not including the huge Forum Shops at Caesar’s Palace, and the 1.3 miles of shops at the Miracle Mile mall in the Planet Hollywood hotel opposite the Bellagio. Las Vegas used to be the place you came to gamble, but now it seems it’s the place to go to shop! There’s even an underground car park for guests. Unlike other hotels around the world, though, the Pallazo will make sure you’ll be able to find a parking space – it has room for 4,000 cars, all beneath the building! 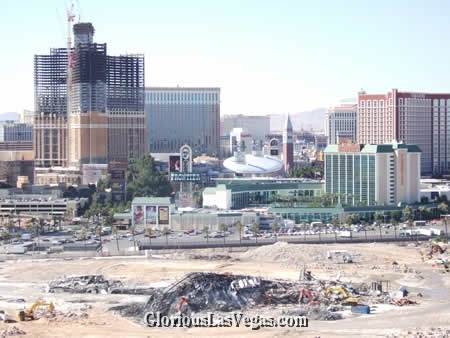 The Palazzo is costing $1.8 billion, and its construction is currently well under way, as you can see from the pics above (the photo immediately above shows the Palazzo to the left, with the steaming heap of rubble at the bottom being the old Stardust that’s about to become the new Echelon Place – see below). The grand opening is expected to be late 2007, early 2008. Now we start moving up the scale a bit, with the new Echelon Place. Situated on the site of the old Stardust Hotel, which was imploded in early 2007, Echelon Place is vast. Costing $4 billion, Echelon Place will feature a series of 5 distinct hotels, offering 5,280 rooms over 87 acres of land. the Shangri-La Hotel, offering 400 rooms. and, yes, 350,000 square feet of shopping space. Where do they find all the shops to fill these massive shopping malls that are seemingly springing up at every new hotel? If none of that takes your fancy, it’ll also offer over 30 restaurants and bars. Echelon Place is the most interesting new hotel for me, as it’s right next to Circus Circus, which is where I normally stay whenever I’m in Vegas. The great thing about Circus Circus is, it’s cheap, with big rooms costing from just $36 a night. The bad about Circus Circus, though, is it’s cheap, and you certainly don’t want to hang around any of its bars for entertainment! The closest hotel for decent entertainment is Treasure Island, but that’s a good 20 minute walk away. With Echelon Place opening in 2010, I’ll soon have 30 bars and restaurants right on my doorstep! Excellent news for the budget-minded Vegas traveller! Naturally, I’ve saved the best until last. If you’re blown away by the billions being spent on the hotels I’ve just mentioned (and remember, these hotels and casinos are all currently under construction – they’re not just a designer’s pipe-dream), wait until you hear about Project CityCenter. The brainchild of the giant MGM Mirage Group (who, incidentally and rather oddly, also own Circus Circus) , CityCenter aims to be a complete city center in one enormous complex of hotels, casinos, shops, condos, entertainment venues, parks and rooftop gardens. It’s so big, it even features it’s own power station and firestation! Situated on the site of the old Boardwalk, opposite the Planet Hollywood hotel (the old Aladdin), CityCenter will contain over 7,000 hotel rooms across 5 separate buildings, the largest of which, the 4,000 room CityCenter resort and casino, will tower some 60 stories high. 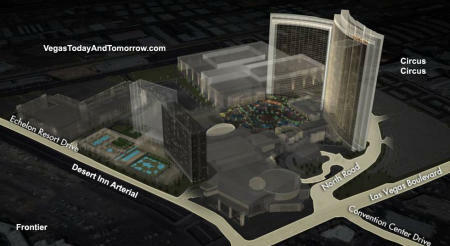 It will also offer a 165,000 square foot casino, a 70,000 square-foot spa, 2,000 seat theatre, and, yes, some shopping. 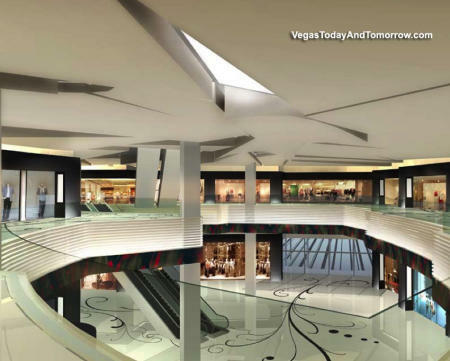 Obviously shopping – it’s what Vegas is becoming famous for – but on a scale unlike anything you’ve seen before. 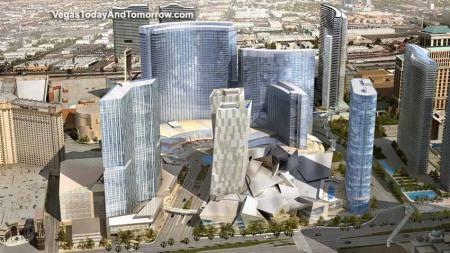 CityCenter will offer over half a million square feet of shopping space! And don’t worry about not being able to find a parking space. If you thought The Pallazo’s 4,000 space car park was impressive, CityCenter will offer 7,500 spaces! No wonder the main strip is a nightmare to drive through at peak times. Each part of CityCenter has been designed by some of the world’s top architects, including Rafael Viñoly, Lord Norman Foster, James Cheng, Art Gensler, Cesar Pelli and Kohn Pedersen Fox. As you can see form the conceptual designs, there will be a mix of the usual towers, and some stunning new building designs that will be enhanced by light shows projected onto the buildings themselves. And the cost of all this contruction? A whopping $7.7 billion! CityCenter is the largest privately-owned construction site in the western hemisphere, and will have 8,000 construction workers and 39 cranes in operation at its peak. It will also employ 12,000 members of staff, and have 900,000 square feet reserved just for back room use. The first phase of CityCenter is expected to open in 2009. So there you have it. Five of the most impressive new mega-casinos currently being in Las Vegas, and all due to open in the next three years. But don’t think that’s all that’s going on in Las Vegas at the moment. I didn’t get a chance to mention the new $1.8 billion Wynn Encore that’s being built next to the Wynn, or the 63-storey $2.8 billion Fontainebleau being built opposite Circus Circus (yet more places to go close to my regular hotel!). And that’s just the buildings that are under construction. Already there are plans for a 1,888 feet Las Vegas Tower that will cost $5 billion, and a London-themed mega-casino based on Harrods of London (which might, I guess, offer some shopping space, because if there’s one thing Vegas needs right now, it’s more shops!). I’ll write about these other new projects (and there are still many more I haven’t listed) in later posts, so checking back for more details on these amazing new mega-casinos and hotels. Las Vegas is in the middle of a transformation right now, the likes of which even this insane city has never seen before. If you’ve never been to Vegas, you have to go, as there’s no other place on Earth like it. Go now, and then again in 2010, and compare and contrast the two, as Vegas in just 3 years time will be utterly transformed. I assume (according to the pictures and your writing, that the Cosmopolitan and City Centre are on the exact same location. Or am I mistaken? 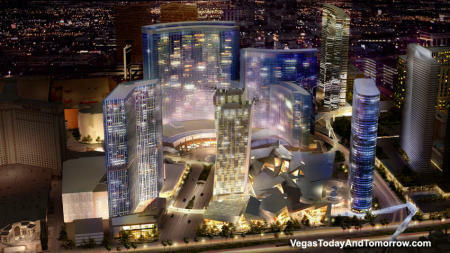 Ralph, the Cosmopolitan will be a neighbouring resort to City Center, sitting between it and the Bellagio. It’s a a separate resort from City Center, though.